Sitter: Hon. Harry Lawson Webster Lawson, later 2nd Baron Burnham, and since 1919 1st Viscount Burnham (1862-1933). Biog: Proprietor of The Daily Telegraph (1903-1928); Conservative Mayor of Stepney (1907-09); M.P. (U) for Mile End Div., Tower Hamlets (1910-16); Colonel Commanding and Hon. Colonel, Royal Bucks. Hussars. 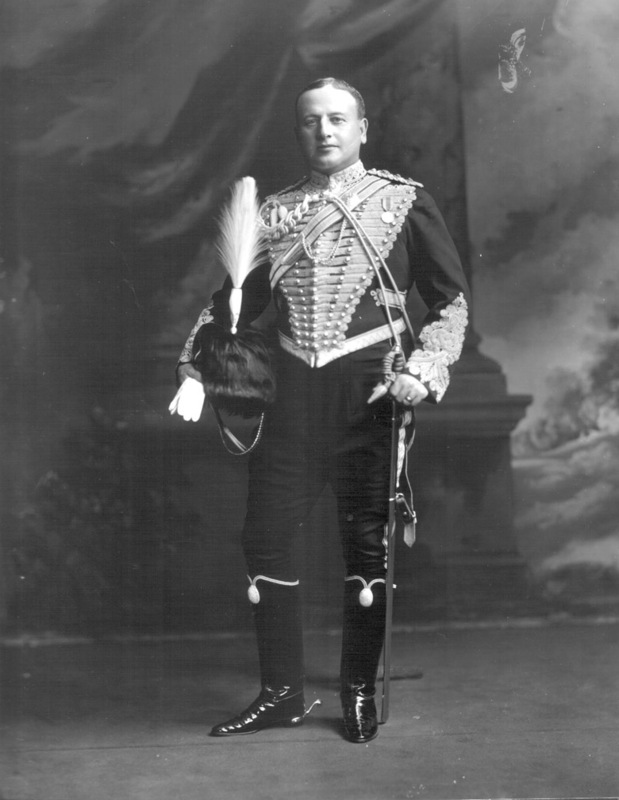 Costume: Full Dress uniform, Colonel, Royal Buckinghamshire (Hussars) Yeomanry. Orders, Decorations & Medals: Queen Victoria Jubilee Medal, 1897. Evidence of photographer at work: Clamp visible. Biog: Dictionary of National Bigraphy; Burke's Peerage; Who's Who; The Army List, 1908; The Times, 21 July 1933, p 21a; The Daily Telegraph, 21 July 1933, p ? (CK!). Orders, Decorations & Medals: H.N. Cole, Coronation and Royal Commemorative Medals 1887-1977, London, 1977.